This plant was built to consolidate three other locations in Chicago. 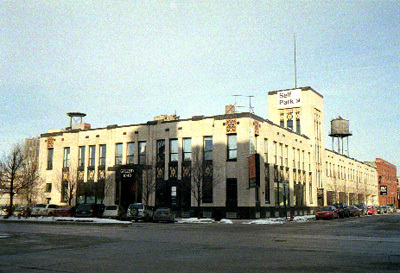 At the time, much of Chicago’s industrial expansion was occurring at the outer reaches of the city and in the suburbs, this plant being an exception to the rule. 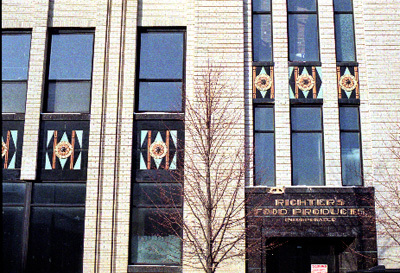 However, much of Chicago’s food processing industry did remain in the central area instead of relocating elsewhere, so the example of Richter’s isn’t too out of the ordinary. What is odd (and delightful) is the cost and design expended on the factory, which was built in a then-declining area. The wonderfully colorful art deco design reflects optimism at the beginning of the Great Depression. The water tower is artfully concealed by the central tower of the building. Such rare amenities as air conditioning for the office spaces were featured when the plant opened in 1932.15 Remarkably, the former Richter’s factory remains quite intact, and is currently in use as a furniture gallery. This article was last updated on Wednesday, August 12th, 2009 at 11:17 pm.